Coastal button celery. Sounds harmless, right? But no. Another common name–prickly coyote thistle–is much more appropriate for this diminutive but sharply armored little plant. Found on bluffs and in coastal prairie, it can spread into dense mats that are impassible to dogs and even humans. It is common on my family’s land in northern Sonoma county, and many a hike has been hampered by sandals or forlorn dogs standing motionless, an afflicted paw held up in the air. Once the sharp bracts have dried and hardened, it can pierce through tennis shoe fabric, and you really don’t want to fall over in the stuff. Or sit down in it. Or bring it home in the treads of your shoes, and find it later with a bare foot. But it is a pretty little plant, and a native. Latin name Eryngium armatum, it has several cousins, many also types of “celery” with varying degrees of prickliness to them spread across California and beyond. Some of these other Eryingium look extremely similar, some notsomuch. A few of the leggier species look much more like culinary celergy does, and make the name seem less like a cruel joke. I was unable to find any references to it being edible in any way. It’s blooming season for phantom orchids (Cephalanthera austiniae), a lovely denizen of mixed conifer forest. If you stop to admire some, be sure to give them a sniff–they have a mild but very sweet fragrance, reminiscent of vanilla. The lack of chlorophyll indicates that these little beauties don’t photosynthesize. Instead they are “mycoheterotrophic”, meaning they absorb nutrients from mycorrhizal fungi, which in turn gain their nutrients from nearby trees. 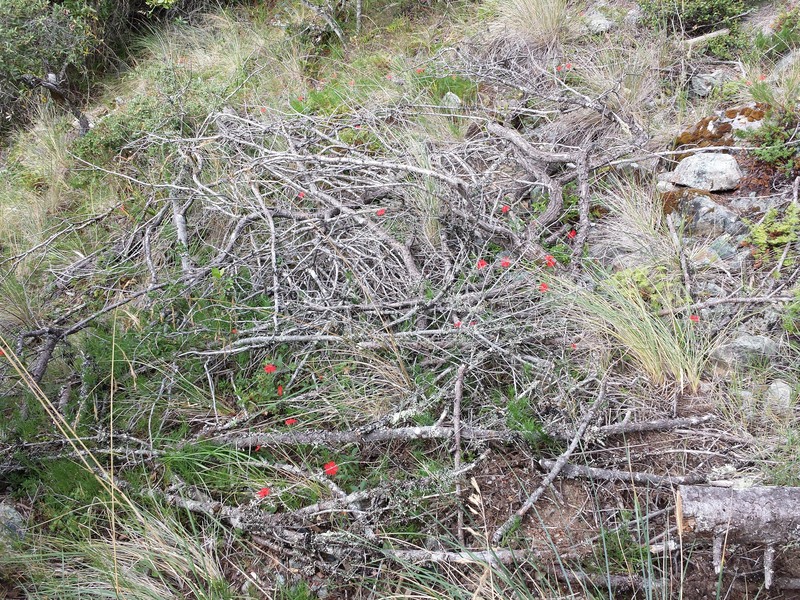 They have earned their ghostly designation – they can remain dormant for up to 17 years, and reproduce sparingly in the wild and not at all in cultivation. The patch that grows in this location appears most years, under an open redwood/Doug fir/pepperwood canopy. Look quick, the buckeye trees are putting on a fantastic show this year! Along creeks, roadsides and rocky outcrops, masses of creamy flowers are on dramatic display against a backdop of vibrant green leaves. 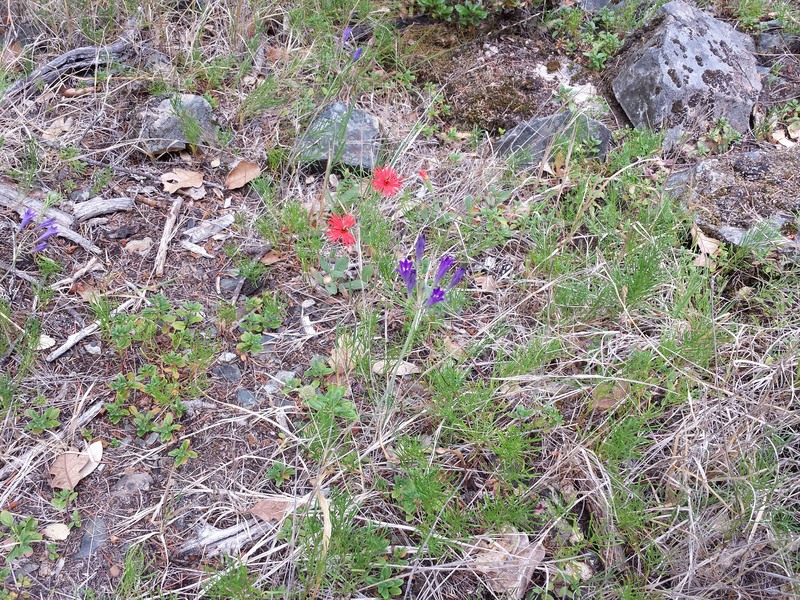 In drier areas the flowers are already fading, though, so be sure to look for them soon–a drive through the back roads of West Marin is an easy way to spot some. This species (Aesculus californica) is probably our most eye-catching flowering tree, with its pinkish-white spires of blooms that are popular with butterflies. I also love its gnarled limbs and graceful umbrella-like canopy, as well as the large, shiny brown nuts that ripen and drop in the fall. Coast live oaks (Quercus agrifolia) seem to be delighting in the rainy spring–everywhere I go, trees are drenched in blossoms, a green-on-green superbloom that is just as exuberant as the wildflower displays (though much more subtle). If you start to notice them, like I have, what you are seeing are the showy male catkins. These start out pale when young and age to an olive-yellowish color; the female flowers are tiny, and hard to see even up close. This vigorous bloom doesn’t necessarily mean that there will be a heavy acorn crop come fall, however–too much rain can suppress pollination if it comes at the wrong time. Crimson flares from the underbrush. 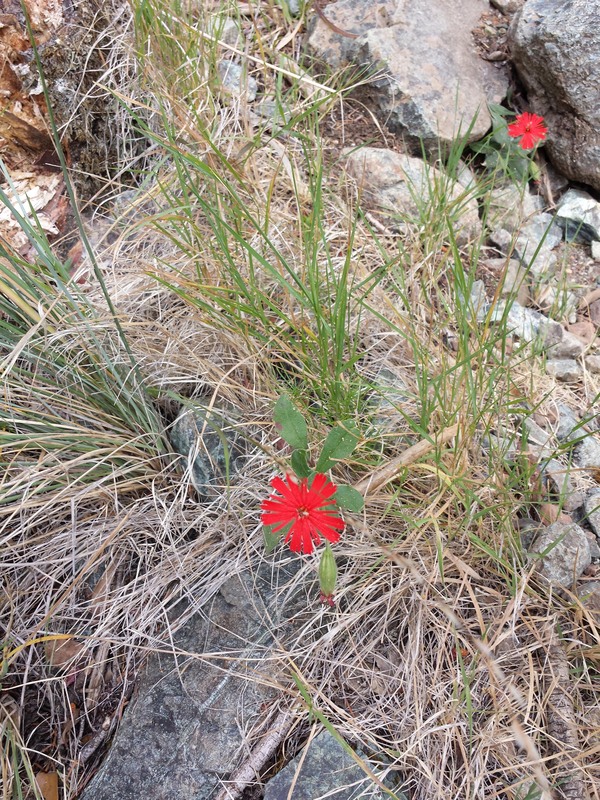 Cardinal catchfly (Silene laciniata) is such a bright red that it messes with the eye a little bit; the flowers pictured here seemed especially bright when spotted in the serpentine chaparral on a foggy Mt. Tamalpais hike. 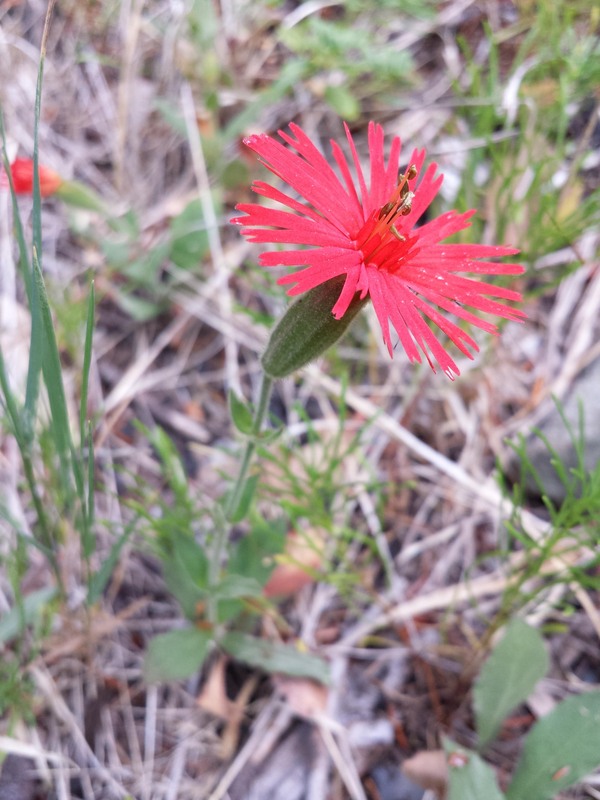 This glorious little native is in the Caryophyllaceae family, which also houses the classic carnation. But the intense color and extravagant petals that are lobed into a fine fringe put the tame storebought blooms to shame. It grows throughout California, and ranges south as far as Texas. 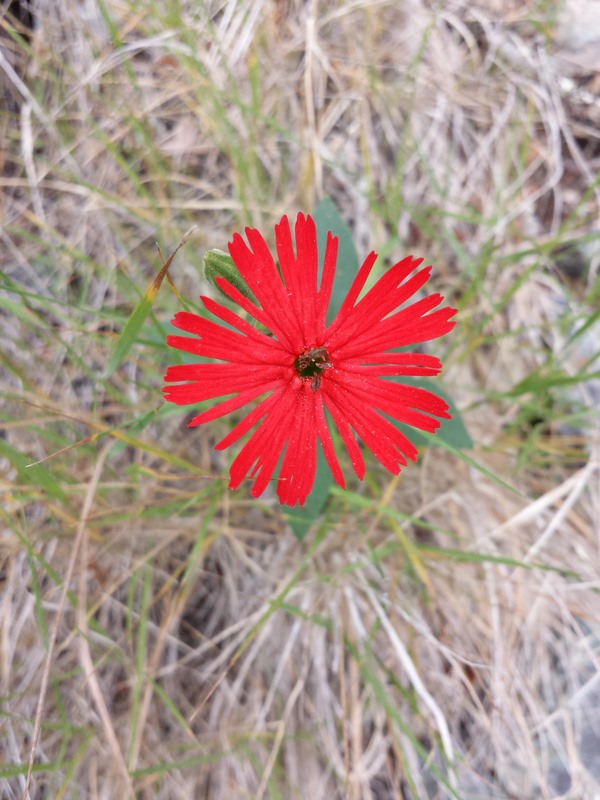 Native Americans used it medicinally as a poultice for burns and ant bites (as well as a treatment for mad dog or coyote bites).